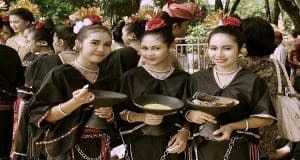 The Island of Lombok has been famous as a tourist island and has a variety of regional culture that has grown rapidly in the community to attract the island for the foreign visitor to visit. So if the cultural diversity of the area is managed professionally then it will be able to attract local and foreign tourists to visit Lombok which will eventually be able to increase people’s income. 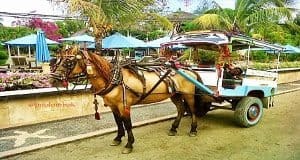 Cidomo or sometimes called Cimodok is a means of transportation using horsepower typical in Lombok and Gili Islands. The main difference from a Delman is that Cidomo using a used car wheel instead of a wooden wheel. Meanwhile, until now, this means of transportation is still a major means of transportation there, especially in areas not covered by public transport and areas of people’s economic centers such as the markets. Nyale is a party or ceremony known as Bau Nyale. The word Bau comes from the Sasak language which means catch while the word Nyale means sea worms that live in rock holes beneath the sea surface. 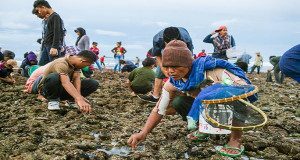 Bau Nyale is a hunting event for marine worms. The event is held around February and March. Gandrung Lombok Dance is a traditional dance art from Lombok performed in pairs between female and male dancers. Gandrung Lombok dance is actually almost the same as Gandrung dance in Java and Bali. However, there are also some differences that characterize both, in terms of movement, costume, and presentation of the show. Gandrung Dance is popular among the Sasak tribe and it is also called Jangger. Some historians say that gandrung dance has existed since the Erlangga era in East Java. Sasak traditional dress for women is called Lambung. That is a black sleeveless dress with a collar in the shape of a “V” and a bit of decoration in the shirt fringes. This outfit using a material called Pelung and added a dangling scarf on the right shoulder patterned with Ragi Genep which is a typical type of Songket Sasak cloth and combined with a belt that is wrapped at the left waist. For the lower clothing then they wear long clothes to knees or ankles with embroidered edges at the fabric with plaid or triangular patterns. Songket fabrics are woven fabrics made with the technique of adding feed yarns, ornaments made by inserting silver threads, gold or colored threads over Lungsi threads, sometimes also decorated with beads, shells or coins. The weaving skills for the Lombok Sasak tribe is a skill learned mostly by girls since childhood and is used to be a requirement before girls are allowed to marry. 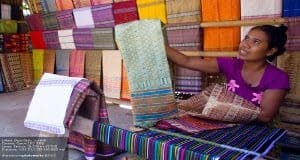 Songket weaving is currently found in villages such as Getap village and Sukadana village in West Lombok, as well as Ungga village and Sukarara village in Central Lombok. Peresean is a battle between two men armed with cane rattan and buffalo shield that is thick and hard. Peresean fighting with rattan is the unique culture of the Sasak tribe. 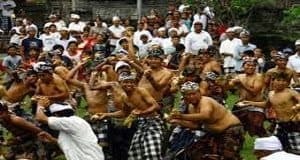 At first, Peresean is only done during traditional ceremonies that are always held in the seventh month of Sasak calendar in order to ask for rain. 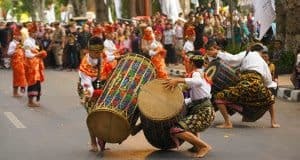 However, now Peresean often done in the celebration of independence day of Indonesia and a spectacle that is unique and interested by tourists. Sade is one of the villages of Rembitan, Pujut, Central Lombok. This village is known as a hamlet that retains the Sasak tribal customs. 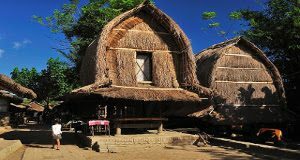 Sasak Sade tribe is famous in the perspective of tourists who come to Lombok and the local Tourism Office often makes Sade as a tourist village. This is because of the uniqueness of Sade Village and the Sasak tribe who became its inhabitants. Sade Village has its own uniqueness. Though located just beside the smooth asphalt road, the people of Sade Village in Rembitan, Central Lombok still hold unpaved road to maintain the authenticity of the village. Rudat Dance is a traditional dance that comes from the Sasak tribe, Lombok, West Nusa Tenggara. This Dance Rudat acts like a Karate show. Because there are movements of a punch and a kick. Rudat dance is used in welcoming guests and formal government events and this dance have existed since the 15th century which is one of the ancestral heritage. 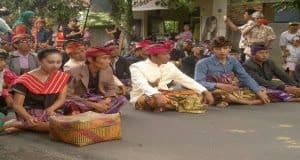 Nyongkolan is a cultural activity that accompanies a series of events in a marriage procession on the Sasak tribe in Lombok, West Nusa Tenggara. 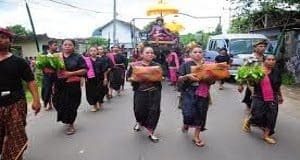 This activity is the procession from the groom’s house to the bride’s house, accompanied by family and relatives of the groom, wearing traditional clothes, as well as a group of music that can be a gamelan or group of tambourines or accompanied by Gendang Beleq. In practice, due to the distance factor, this procession is not done literally, but usually, the entourage begins walking from a distance of 1-0.5 km from the bride’s house. Ketopat war is a traditional event held at Pura Lingsar, Lombok. This mock war is a symbol of peace between Muslims and Hindus in Lombok. This event takes place in the afternoon, every seventh full moon in the Sasak calendar. In the afternoon which is the peak of the event that was performed after the Ashar prayer. As thousands of Hindus and Muslims meet at Pura Lingsar and these two communities of believers held a ceremonial procession of Puja Wali, as an expression of gratitude to the blessings of the Divinity. Art performance of Slober is one type of traditional music of Lombok that’s classified as very old, where the collection of musical instruments is unique and simple. Slober art performance is supported by other complementing equipment that is Drum, Petuq, Rincik, Gambus, and Flute. The name of Slober art is taken from one of the villagers of Pringgasela sub-district named Amaq Asih aka Amaq Slober. This art is believed to be one of the old art forms that still exist until now and is usually played on every full moon. Memaos contest or reading lontar is a race that tells the story of the old kingdom of the archipelago in the past time, where it is known that one group of storytellers consists of 3-4 people. One person as a reader, one person as a poet and one other person as a supporter of vocals. The purpose of reading this story is to know the culture of the past and to learn the old cultural values that have been neglected in the future generation. Art Memaos is re-appointed as a cultural asset and can be used as a tourist attraction, especially for cultural tourism. The Sasak people believe that Rebo Bontong Day is the peak day of disaster or disease infection so that’s something taboo for them when they start working right on Bontong Rebo Day. The word Rebo and Bontong mean more or less “break” or “splitter”. 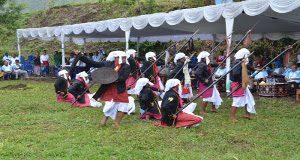 Rebo Bontong ceremony is meant to avoid disaster or disease that may befall upon their village. This ceremony is held once a year on Wednesday in the last week of Safar month in Hijri calendar. From the word “bubus”, which is a kind of medicinal herb made from rice mixed with various types of plants, and from the word stone which refers to the stone where the ceremony is held. Bebubus Batu is a ceremony held to ask blessings to the gods. This ceremony is held every year, led by Penghulu (cultural stakeholders) and Kiai (religious scholars). The people are busy wearing traditional clothes and carrying a tray as offerings from their agricultural products. This ceremony is conducted to strengthen the bonds of brotherhood, unity and mutual cooperation between communities, and love among God’s creatures. Tandang Mendet is a Sasak Tribal war dance. It is said that this dance has existed since the days of Selaparang Kingdom. This dance is depicting the power and struggle and is played by dozens of people dressed up and carrying fighting instruments such as a sword, shield, and Spear. The dance is accompanied by the beat of the Beleq drum and the recitation of the poetry for struggle. 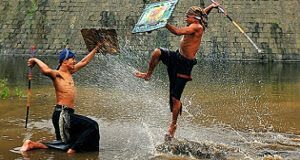 This is a folk game that has elements of art and sport, even including traditional games that are classified as old in the Sasak society. 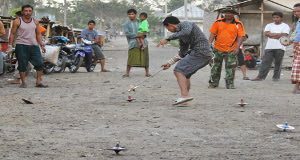 This traditional game is also known in several other areas of Indonesia. Only, the spin that sasak people use differ both in form and rules of the game. For the large spinner, they name it a stirrer and is used to punch away a smaller spinner. For another word called “gang” which means “location”, and from the word “sing” means “voice”. This traditional game knows no age and place, can be played by anyone and can be done anywhere. One of Lombok’s world-famous arts as Beleq drum is a show with a large percussion. The musical compositions can be played in a sitting, standing, and walking position to parade the procession. As the bearer of the melody is a small drum and as a rhythmic tool are played two Drum and a large gong. According to the story, Beleq drums used to be played when there are parties or ceremonies organized by the kingdom. In case of war, then this Drum serves as a booster morale of soldiers who fought the enemy.